Trixie, our first family pet, passed just after Thanksgiving 2001. Losing our best friend was the saddest day of my life. This service is named in her memory. You'll help write the daily plan. If you’re happy, I’m happy! I will not copy your keys and will return them promptly when you arrive home. Long commute? Unexpected Overtime? Expecting Company? Break up your pet's boring day with a dog walk! She'll enjoy the “time out” and you won’t have to hurry home (and wonder what surprise may be waiting for you). Providing her with an opportunity to relieve her bladder and have a little snack may reduce your stress! If you're expecting company in the evening, midday playtime will help burn off energy. She may be calmer around your guests! Once we’ve signed a Service Agreement, I will be "on call" for all emergencies (between 6am and 7:30pm). Schedule dog walks daily, two to four times per week, or weekly - whatever suits your needs. Is Your Dog Getting Exercised? Do You Need Recovery Time? Are you recovering from an illness or accident? No pre-visit required if you'll be at home. If you're concerned that your dog needs to be walked but pulls too hard on the leash, I'll control her - and you can come with us when you’re ready! Is your pet scheduled for a routine vet checkup or grooming appointment? No need to take time off work or schedule an appointment during your weekend. Here are a few examples of when a sitter would have been a big help to me. We adopted Cleo (10 weeks) on December 30, 2001. Oh what fun a puppy is! Oh how stressful housebreaking is! At 15 months we finally had a perfectly housebroken dog (30 consecutive days dry). We needed help during that time. I wasn’t comfortable asking for favors from friends and neighbors. It was hard to reinforce the correct place to pee when every three days there was an accident because no one was there to give the puppy an outdoor break. The books say the puppy should be able to hold her water one hour for each month of her age. I was so happy when she was finally eight months! But then emergency situations would arise when we were stuck at work. I would hope my cleaning help, Teresa, would save the day. She usually did! And she was generously compensated. It was easier for me to ask for help from a “professional” than wear out my welcome from friends and neighbors. Now I can offer you a choice! I would have liked help when we were having our addition built. If someone was available to take Cleo to the park for an hour, I’m sure she’d stop barking at the guys and take a nap. I did feel guilty, and did consider putting her in a kennel during the day. I didn’t want her to stress the guys out. The builder was very patient with her, and somehow we all survived. Cleo has been a member of the Ocean County Dog Park since June 2002 when she was seven months old. What a great place for a puppy to exert her energy! Cleo would sleep for hours after getting home, and I could get my chores done. We still go every weekend. She’s quite social! Spending the last four years of weekends at the park has been an opportunity for pet owners to socialize too, and trade pet stories. Many times people would wish they had someone who could look in on their precious pets during the day. Many have long commutes, longer than mine was! Others go on vacation, and would like an alternative to boarding at a kennel. Many pets are most comfortable in their home environment, sleeping in their own bed. I’m hoping to make these needs a reality for the residents of Forked River and Lanoka Harbor. 20 - 30 minute appointments are allotted, which includes travel time from my home to my local service area, potty time, dog walk or indoor play, feeding, and basic house sitting needs. This is why my local service area is Forked River and Lanoka Harbor – new clients must be within four miles of the intersection of Lacey Road & Manchester Ave. Longer distances require an additional fee. A one-mile walk could be accomplished in the set time for active dogs, unless, of course, you prefer she plays at home. Add $5.00 for extended visits – each additional 10 minutes needed. Add $5.00 for each visit further than four miles from my home office, including all of Bayville and Waretown. Add $5.00 for tasks requiring pet-taxi service. Add $5.00 for each holiday visit (New Year's Day, Easter, Memorial Day, July 4th, Labor Day, Thanksgiving, Christmas Day). No add-on fee for additional pets. See extended visit fee above. No interview fee or key drop-off fee. Overnight travelers must schedule at least one visit each day for cats, and a minimum of two visits each day for dogs. Most people choose three or four visits for dogs – the choice is yours. Rates are approximate. Your explicit needs are considered. Rates posted on this web page are subject to change with 14 days notice. Notification will be sent to existing clients via email or text message. “We felt very secure that our dogs were well cared for and kept on their normal routine.” Kathy & Tony G.
“I felt very secure knowing my pet was in such good hands and all the personal one-on-one treatment he received!!! I would recommend Joanne ten times over to other pet owners!! !” Kathy D.
“I didn’t have to worry about cats. Didn’t have to burden family or friends with cat box! Kathleen S.
My name is Joanne Fischer Cottrell. I'd like to take a few minutes to tell you about myself and describe my previous work history. My husband, Cliff, and I moved to Forked River in March 1989 and adopted our first family dog in 1991. Cliff’s son named her Trixie. After eleven faithful years, Trixie developed kidney failure and soon passed. It was the saddest day of my life. Through my activities, I’ve kept “Trixie” as a part of my daily routine. At my last job, I’d name projects or files using her name. Now, “Trixie” is in the name of this service – in her memory – a true best friend! Favorite hobby: Cycling, learning about health and wellness. Favorite audio books: non fiction - uplifting, positive subjects. Favorite places to relax: The ocean at Seaside, Barnegat Rail Trail. Cliff and I have taken extended vacations in Virginia and Alaska. We've taken three-day weekends to attend NASCAR events. We have much more fun on our three-day weekends, and are ALWAYS eager to get back home! There IS no place like home! And we're both workaholics. So passing on long vacations IS our lifestyle. When we do schedule weekend events, I will let you know at least a month in advance - probably more. 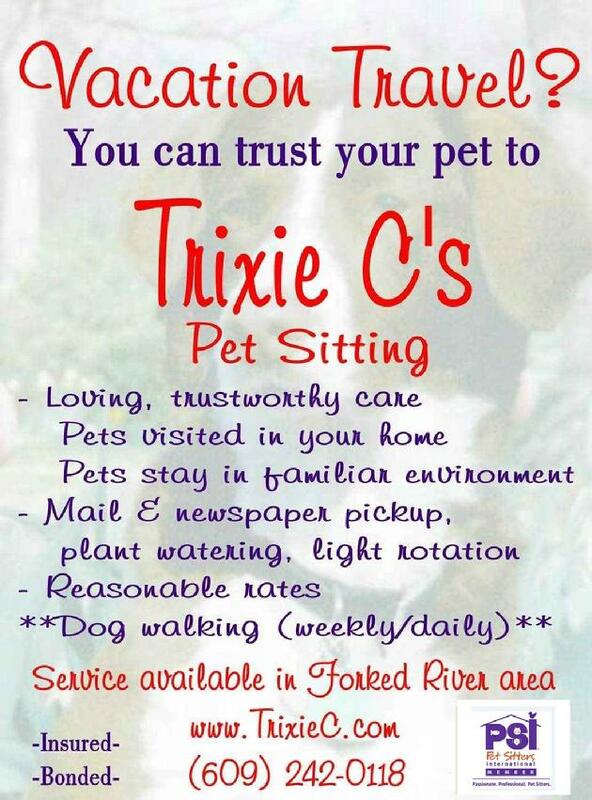 If our vacation times coincide, there’s another pet sitting service in Forked River you may like to try. Carrie Hammer owns All Creature Comforts, 609-971-7390, http://www.all-creature-comforts.com/ - and is also a member of Pet Sitters International. Our businesses are individually owned and operated, so service agreements need to be signed for each business used. Shortly after turning 21, I worked at Wawa. After a year I was promoted to shift manager, and soon was store manager at Route 571 in Manchester. I enjoyed providing services to the people more than staffing a store (who can you trust?) and maintaining inventory. After four years, I needed a change. Next, at 25, I was a construction-clean-up laborer at Holiday City. This only lasted a short while. After a few months, I was promoted to supervisor. UGH! The tasks became repetitive quickly - the house models never changed. I made more money laboring with overtime! The company truck was nice, but I was happier getting my hands dirty. At age 26, a survey company in Toms River hired me. Our field support was thirty people strong. This was my favorite job! Surveying was outdoor work, sometimes-hard physical work, and lots of in-field calculating. It was great having a sense of accomplishment at the end of the day! When construction slowed, the staff was downsized to just two. I was one of the two – a true compliment! Although I was female, I could pull my weight! I had the desired working attitude. A dermatologist informed me I shouldn’t be working continually in the sun and suggested I change my career. You’ve got to be kidding! I’ve been doing this for ten years – I was afraid of starting over. I researched careers in greatest demand at the time requiring the least amount of school, and decided to attend Brick Computer Science Institute. At age 37, I got a great job on a government contract at Fort Monmouth working as a Systems Administrator (SA) – thanks to my Microsoft Certified Systems Engineer (MCSE) certification! Wow! I couldn’t believe it! How lucky I was! I was on a team of Information Technology (IT) professionals – all in the business for more than twenty years. The team needed to know about the current skills I obtained in school, and I was privileged to learn a variety of troubleshooting skills from them. This was great! After four years – here it comes again – downsizing! I was shifted (promoted) to a position that required over an hour of travel time each way to the location of the prime contractor, AND had more responsibilities. My new title was “Network Security Officer” (NSO). I was overseeing network security on a multi-million dollar software project. At first it was exciting learning my new tasks – however I wasn’t “hands-on” using my Microsoft skills. The gloom and doom of downsizing and wondering who is leaving next has been pure torture for the last two years. Staying for the paycheck (versus dealing with the stress) has gotten old (never was my style). I resigned on December 15, 2004. Now I am devoting my time to providing professional, reliable, dependable services full time - WHAT I LOVE TO DO! I am thrilled and excited at how Trixie C’s Pet Sitting has grown! I’m hoping the time and experiences I spend with your pet will increase BOTH of YOUR qualities of life! Working with the DoD as SA and NSO requires a high level of trust involving extensive background investigations (both character and credit). Providing in-home pet sitting services requires a personal level of trust, and you should feel comfortable with your choice. UPDATE: From my first visit in November 2004 through December 2017, I have performed over 40,000 visits to more than 250 happy households!